I got GalCiv III to run on my Surface Pro 4 by manually updating the video drivers to the latest ones by Intel. The official drivers from Microsoft are a year old and those drivers claimed to be DirectX 11 capable drivers (they were not) and so the game would crash when trying to do a DirectX 11 specific call. If you have an embedded Intel video adapter, do yourself a favor and head over to Intel's site and download the drivers. I had to download the ZIP file and then extract it and then manually install the driver as it isn't digitally signed. The biggest issue I have with my Surface Pro 4 is that it throttles. Badly. It would play GalCiv III like a champ if it weren't running at 860Mhz. There is no perfect balance because what is balanced is in the eye of the beholder. That said, we are looking at adding more options (such as disabling espionage) to allow players to customize their game experience further. Population is going to be tweaked so that 1 point of population = 1 raw production. This will require some balance changes on morale and farms and such but this is the most elegant way to make population be more powerful. Planets will tend to start with 1 population. Tourism will eventually be tied to your cultural influence. We are starting to keep track of how many tiles you control and how many are congruent to your capital world. Minor races are going to be getting friskier in the future (as in, provide opportunities for early game limited wars). AI generated offers are awesome when relations are decent. Cultural conquest is coming along nicely. Right now, much of our work is on polishing the UI, making quality of life fixes and fixing bugs that we get reported. We are also trying to make modding a lot easier so that people can enable subscribe and unsubscribe from mods more easily. The AI is something we continually update as we get new saved games from players and just play test over and over again. Each time we play, we see something that we think can be improved on. I'm in the debugger now. So more to come. This is a very strong reason why I support this company. Continuous support and love from the CEO himself. Some of us may go back and forth over opinions and details but in the end a company where the CEO is actively involved in the game has a vote from my wallet. Keep up the good work. 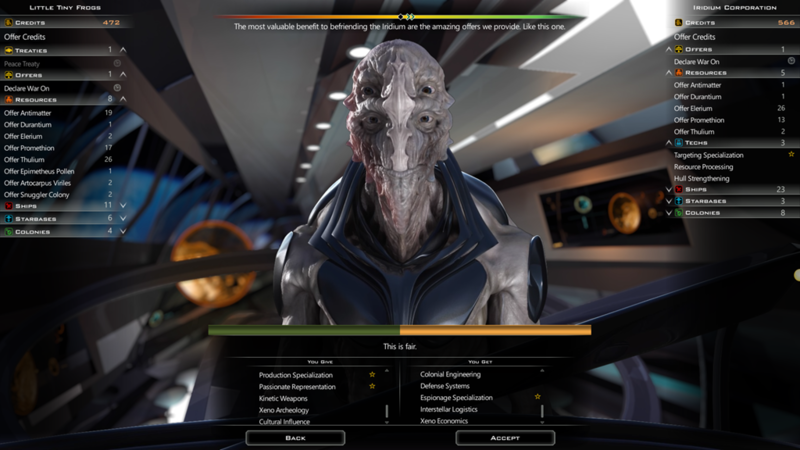 I'm curious: will the production cost of improvements, repeatable projects, and research be rebalanced or will everything just get slightly easier to build/research (and thus speed up the game)? Thanks for the continuous work on an already great game! Nobody asked you to make it perfect. But a balance that does not render other game elements irrelevant (e.g. 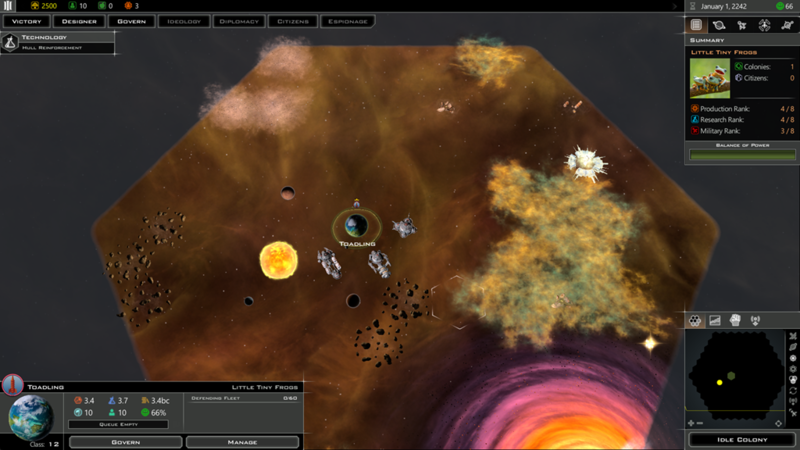 jamming renders defenses nearly irrelevant) should be expect from a veteran game designer. because what is balanced is in the eye of the beholder. No. 'Balanced' is a state of the game where from several different ways of playing the game, no minority is outperforming all the others. Good balance is hard to pinpoint, since the system is complex, but a good indication is dynamic debate i.e. the topic of what is unbalanced changes every few weeks. Durantium cost on xeno factories for example is a blance issue, there is no debate I have seen about it and the cost for additional 2,5% manufaacturing is considered excessive. For some situations you can math some good estimations as to how much you get out of something. For planetary improvements a return of investment calculation can be a start. For the benefit of defenses and jamming, the benefit can be estimated in effective HP added (per point of mass/manufacturing/upkeep/strat ressource) by the component. That said, we are looking at adding more options (such as disabling espionage) to allow players to customize their game experience further. Sheesh... I really hope you see all the strings attached to this? What I am trying to say is, you had an assumption and maybe some gameplay data of what amount of production feels right at about turn 10/30/60/100/... Is there no better way to finetune what we have and what is a known quantity? I think this is a point where balancing is in essence like polishing, in that you need to iterate on an idea in order to get it to a better point and not redesign the entire thing. Thank you! Looking forward to this. The overpowered asteroids effect just doesn't sit right with me. I look forward to your balanced game release. It is easy to arm chair perfect design. When you say "subscribe and unsubscribe" for mods... this suggests possible Steam support? Or... are you simply referring to how many of the game's files can't be append styled or otherwise can't be modded through a mod folder and we have to add files to the directory (Replacing Merc's Ship designs for example, won't work unless those designs are added to certain zip files in the game's directory. Also I'm loving the look of that influence screen... and I think we are all looking forward to some polish. Thanks so much for sharing! Surface pro to expensive. For that price i.would buy a desktop. A tablet.should be around 100 dollars. 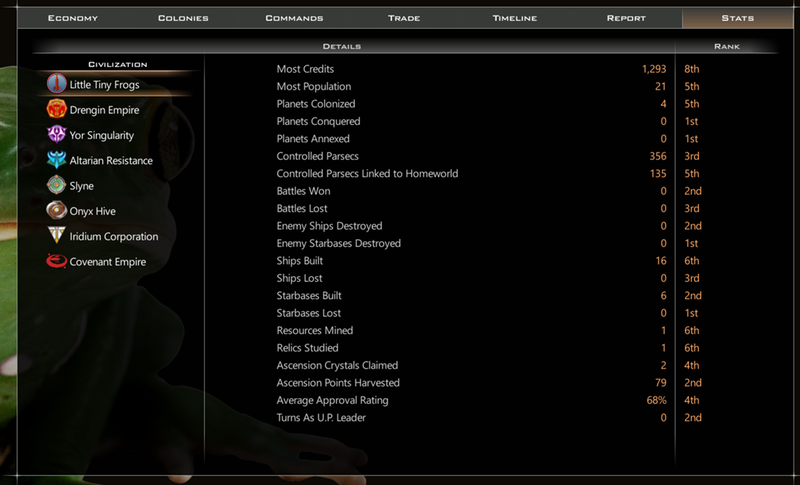 Maybe you could convert galactic civilizations 2 into tablet. Convert apk files into exe files. Compile the text files. You would also have to write controls for the game. Nice to hear your balancing the game. And make it for the android. Wondering are you also planning to come out with more specialised techs for the chosen abilities. Can we also have more race types when customising civilizations. I agree with Frogboy that a perfect design is more or less impossible to reach. But I also agree with zuPloed that no game element should render another game element useless. For me, it is a thing that makes me a fan of Stardock, but I have to draw a line as to what that means. If another game is better, it's better. For now, let my feet do the talking--I'm here. I think balance is somewhere in the middle, and is like beauty: it is in the eye of the beholder, but there are things & people that are generally accepted as beautiful, even if we can't quite put a finger on what exactly makes them beautiful. I think Reese Witherspoon is drop-dead gorgeous. Someone else just might not be into blondes. But still, she is generally regarded as beautiful. A while back i was thinking about the late game grind, and i came up with an idea. After a certain number of turns maybe 400 whatever you consider the late game. From a programmers change out databases. Anonolies, mega events, random events, and galactic council suggestions. As far as colonization events go seperating extreme world event from terran world events except anyone who gets any extreme worlds from the start would do the trick. If they start out with a extreme world colonisation then that colonisation should be on the same list as terran. Remember doing this would go a long way to spice up the late game. I would like to see a fixed jagged knife brought back as an option. The biggest complaint in the beggining was it didnt work. They couldnt manage their empire. They should be able to rebuild buildings that arent wonders. Being able to tear down buildings would help. This would require them to have an empire wide stradegy. To make it a sweeter deal it should build all the player achievements it can. The other players would notice their planets are gone, amd try to retake their planets atacking the best ones first. This would make it imperitive to take back your planets first. Now the other complaint could be solved. It was a smaller complaint is that some had a problem losing planets if you generated the numbers the same way, but put them on class zero planets instead. You could add population if you wanted. Either by random population, or.migrating citizens from other empires including citizens. This way you dont have to worry about building expense since their are no buildings to start out with. Still sweeten the deal by building all the player achievements. The other players would still try to take the planets. If you do it this way then centrally locating the planets would make sence. In 2 there were 3 id still say have 3. PleASE make this an option. I know they start out with everyones tech, but as far as future research goes. There would need to be randomly generated abilities for future research. The second would have to be close not centrally located. Maybe pick the first class zero to be closest to being centrally located. For the second, and third it would end up being off from center. Then after.the first planet pick pick the closest for the others. Being class zero planets then noone could complain about losing planets. Have they made trade valuable yet? Last I checked the best way for making money was to costs on production and build treasure hunts. I was waiting to play until trade was worth it or I could play an economic focused game. Not likely to happen since they have never been big on trade. You are waiting for a feature they never had. You could still ecenomic focus just not trade focus. Yea, sad to see they won't make that a part of the game though. I would like to be able to play a game where the economics were the focus or strength of an empire. It's odd that the best way to make an economic focused nation is to focus on production rather than trade. 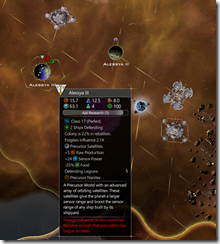 If Stardock simply made Treasure Hunt missions repeatable, there's your trade. Internal trade. You're exchanging about 1 ship construction for 1.25bc. With almost no micromanagement (if they made it repeatable). Trade freighters are still worth little more than a diplomacy bonus, though. Markets are still pretty useless, even adjacent to your Central bank. Ports of Call are not that far behind. I mean come on: +1bc tourism, -1bc maintenance? You have to make +100% economic bonuses just to get 1bc out of it? I did not like the 1 to 1 ratio. It felt unrealistic. worlds should become more disorganized and harder to focus, with more social baggage, the larger the population gets. That feels realistic to me. The square root depreciation was much too extreme to feel right as well. A population to production exponent of 0.92 felt right. It's not really felt until the world is glutted with people and it doesn't make additional growth pointless. Just make the population exponent a tech and/or race trait. Then everyone can be happy. 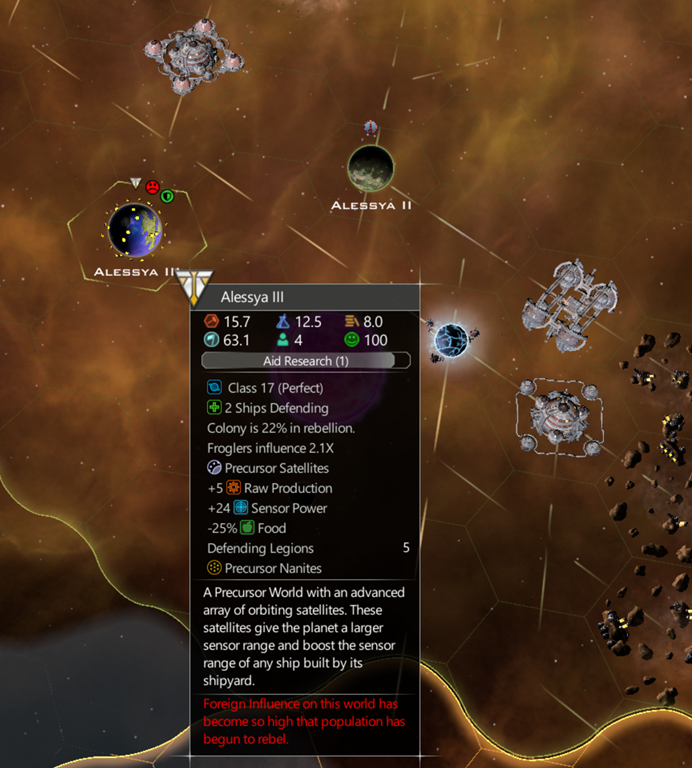 Each minor should have some unique technology or resource that is accessible only by assimilating them peacefully. And of course, their juicy planet, which represents the prize for the other, conquest option. Eeach minor should have some unique technology or resource that is accessible only by assimilating them peacefully. And of course, their juicy planet, which represents the prize for the other, conquest option. I've advocated for a similar kind of mechanic - that when you meet a Minor Civilization that they offer something that, depending on how you're playing the game, you need and so you become A: Their friend because you want what they have and B: Their protector because without them you can't work the way you want to. So you trade with them, have great relations with them because of that ability/technology/ whatever it is they have. And when some other Major Civilization steps in, that's a reason for conflict - with whatever help the Minor Civilization can give. I appreciate in the end game Minors would tend to get invaded/sacrificed for The Greater Good Of The Majors, but in the early-mid game Minors could still play some part in how things pan out. The square root depreciation was much too extreme to feel right as well. A population to production exponent of 0.92 felt right. It's not really felt until the world is glutted with people and it doesn't make additional growth pointless. I love this. 0.5 is far too harsh and 1 is too generous. Somewhere between 0.75 and 0.9 is probably my ideal. Balance here is definitely in the eye of the beholder. I'll probably mod the game going forward depending on how fast I want to play. Why not add this as an option slider when you start the game? Just steal the volume slider UI element. 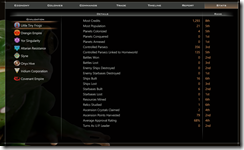 Just let minors have mercenary ships they are willing to trade. And alliance treaties. If you invade the minors, you tick off everybody else, incur a warmonger diplomatic penalty, and you declare war on their allies. Even the Drengin you tick off--they're mercenaries. Drengin love mercenaries. Please, please work further on faster turn processing and Invasion and space battles!! For me this are the only things left to make this game awesome. Please don't speed up tech research.